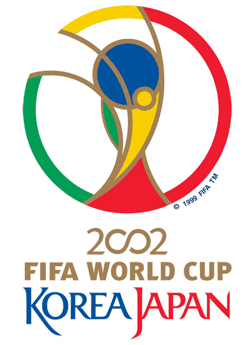 The 17th World Cup was played in South Korea and Japan from 31 May to 30 June. For the first time the World Cup tournament was held in Asia and for the first time was the hostship shared by two nations. A total of 199 nations, a record, were involved in the qualification. Finally, 32 teams would be competing in the final tournament (including the three automatically qualified nations – the both host nations plus the reigning champions). China, Ecuador, Senegal and Slovenia entered the tournament for the first time. South Korea or Japan were hardly obvious candidates as hosts for the biggest football tournament in the world. Instead of bringing the action to a place associated with football tradition, the reason for the choice were mainly based on an attempt to expand the game into a new market with billions of people. The same model as in the previous tournament was kept. A first stage consisting of group play, two teams from eight groups would go on to play in the knockout phase consisting of four rounds. The matches would be played at ten stadiums in South Korea and ten stadiums in Japan. The final would be played at International Stadium Yokohama in the Japanese city of Yokohama. This was also the stadium with the biggest capacity (70,000). The French team that had won the previous World Cup had also won the latest European Championship and arrived as one of the favorites. France was, however, diluted by injuries on the two key players Zinedine Zidane (that would join the team in the third game) and Robert Pires. The road for another victory would, however turn into a large fiasco. It began in the first match against Senegal – a former French colony which national team consisted of players belonging to the French clubs, among some were in the second division. Senegal won and France would be placed last in the group with only one point and no scored goals. The French failure was one of many great failures in FIFA World Cup 2002. Perhaps the biggest favorites before the tournament, Argentina, didn't go through to the knockout stage. The analyses could conclude that Argentina had had more possessions and more corners than any other team. Despite that, the team managed only to score twice, which may have been because of a tactical formation that made them easy to defend against. Portugal would meet the same destiny as Argentine whereas Italy would be eliminated directly in the knockout phase against the sensation South Korea. South Korea would be the greatest sensation. After defeating Italy, they eliminated Spain in the Quarter-finals and until the saga ended with a 0-1 defeat in the Semi-finals. The marvelous success for this completely unknown team would also be seen plenty disaffection. Some felt that the team had been favored by the referees and especially would the game against Spain – with two goals for Spain rejected – be controversial. The final would be played by the two superpowers in the game, Brazil and Germany, whom strangely enough never before had faced each other in a World Cup match. Germany was once again in a final without impressing especially much in the tournament so far, and furthermore was one of their most important players, Michael Ballack, secluded in the final. A remaining impression in hindsight was that the great teams and the great players performed at the expected level. One plausible reason was that they were tired already before the start of the tournament. The numbers of matches in the World Cup qualifications and also in the big European club tournaments had also increased in numbers of games. The reason behind was the money to could be made from matches for media companies and other involved organizers. When it was time for the biggest event on earth the main attractions (e.i. the star players) was unfortunately not always in the best shape. The innovative official match ball, "Fevernova". 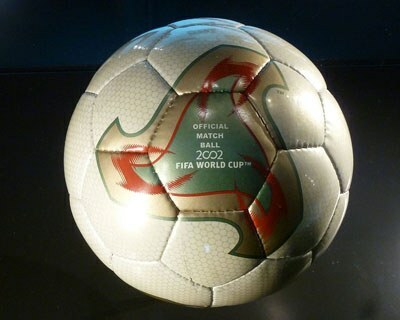 FIFA World Cup 2002 would include 64 matches in which 161 goals were made (2,52 goals per match).